There are many different recipes for chicken egg white Lysozyme crystallization. The main common feature, of these crystallization techniques, described below is their simplicity. Please note: in order to protect your samples from bacterial or fungal infection you must add about 0.02% (w/v) Sodium azide in all solutions you use. Filter all solutions with a micro filter of 0.22 microns. 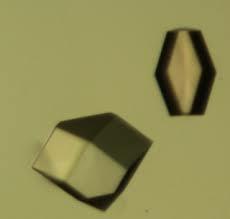 There are two major crystallization techniques, used not only for Lysozyme crystallization, but for almost all proteins are: hanging drop and sitting drop. The main difference in these two techniques is the volume of the protein drop in which crystals are grow. For hanging drop the average volume is about 1-5 microliters, whereas for sitting drop 10-20 microliters is usually used. The crystals obtained from these crystallization conditions are more suitable for non-frozen X-Ray data collection. Prepare 75mg/ml sample of Lysozyme in 0.1 M NaAc pH 4.8. Well solution consists of 1ml of 6.5% (w/v) NaCl and 0.1 M NaAc pH 4.8. Cover slip drop contains: 5-7 microliters of Lysozyme solution and 5-3 microliters of well solution for a total of 10 microliters. Seal a cover slip with grease or vacuum lubricant over each well. Crystals should grow in about 1-2 days. It is a good idea to setup a set of crystallization trays with variation of protein/well solutions and with variation of Lysozyme concentration between 50 mg/ml and 75 mg/ml. Note: Last trials shows that these crystallization conditions can be cryoprotective, especially when the drop with Lysozyme crystals partially dry out. The crystals obtained from these crystallization conditions are more suitable for low temperature X-Ray data collection, because of presence of cryo-protective compounds in the Lysozyme crystallization conditions. Well solution consists of 1ml of 10% (w/v) NaCl, 0.1M NaAc pH 4.8 and 25% (v/v) Ethylene Glycol. Cover slip drop of contains: 6-7 microliters of Lysozyme solution and 4-3 microliters of well solution for a total drop size of 10 microliters. Crystals should grow in about 1-2 days and be ready for freezing. If the size of crystals is not suitable for further analysis, it is a good idea to setup a set of crystallization trays with variation of protein/well solutions and with variation of Lysozyme concentration between 50 mg/ml and 75 mg/ml. Usually, chicken egg white Lysozyme crystals are grown in two different crystal forms. Furthermore, the appearance of these crystal forms is not related with Lysozyme crystallization conditions, but in our experiments we obtain only tetragonal Lysozyme crystals. 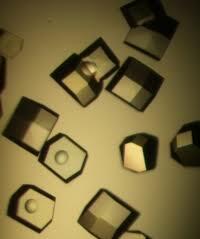 Photography of Tetragonal Lysozyme crystals. 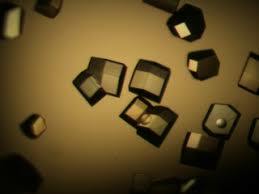 Photography of large Tetragonal Lysozyme crystals. For more information about all crystallographic techniques you can read in the Guide to the Protein crystallography, from Protein crystallization to Structure refinement. Furthermore, you can look through one of the biggest crystallographic bulletin board to see how all scientist deal with these tasks.